Here’s an easy tutorial on how to make beautiful candy corn rock painting using alcohol inks. If you never used alcohol inks before, read my beginner-friendly guide on using alcohol inks on rocks. This sweet rock painting craft is a part of another post called, 31 Days of Halloween Rocks, check it out for more boo-tiful rock painting ideas. If you’re new to rock painting, go to Start Here to get all the beginner rock painting tips and find out the best tools and suppliesto use! Begin by painting a base coat of white craft paint on the rock and let it dry before moving on to the next step. 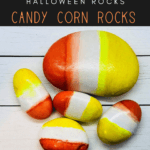 Divide the rock into three sections, just like a candy corn. Be sure protect your work surface by using paper plates or something similar while using alcohol inks. Be sure to wear gloves because alcohol ink will stain your hands, dip each foam brush in each alcohol ink color. Swipe one of the colors across the rock in a horizontal line covering of the top portion. Repeat the same process of swiping the next two colors across the middle and then the bottom. For more vibrant colors apply a second coat of stripes across the rock again. 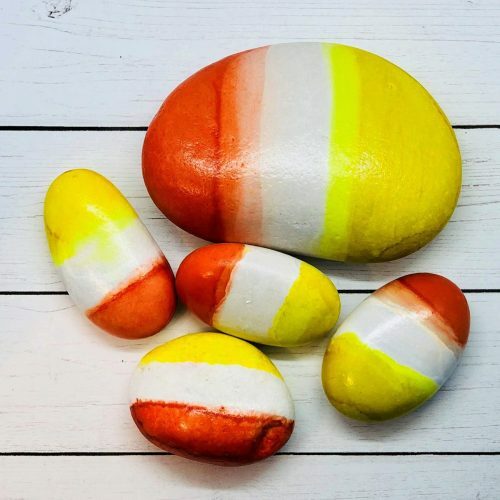 After the beautiful candy corn rock painting is completely dry, spray a light coat of clear sealer on the rocks and let it dry some before applying a second coat. Let it dry for 24 hours before touching the rocks. Be sure to use alcohol ink in a well-ventilated area, due to the strong alcohol odor. 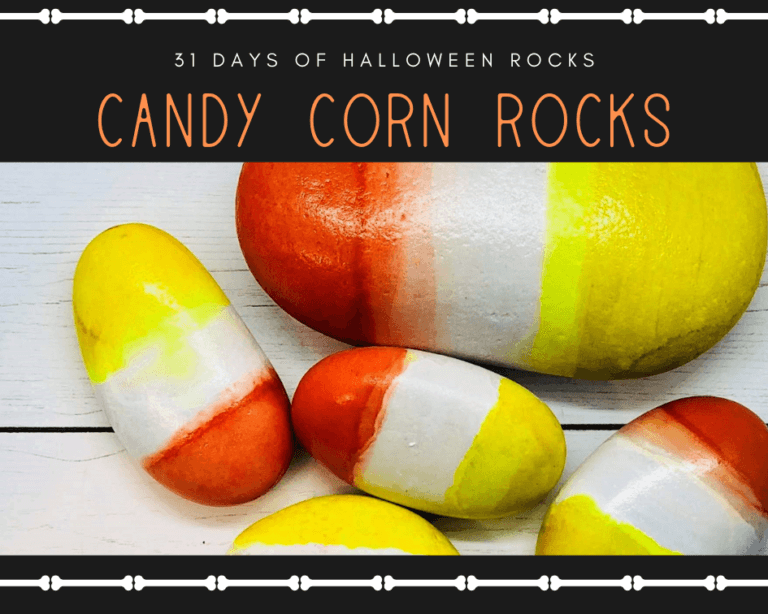 Have you made your own Candy Corn Rock Painting?